The Chihuahuan Desert is a desert and ecoregion designation covering parts of Mexico and the United States. It occupies much of West Texas and small parts of New Mexico, and Arizona, as well as the central and northern portions of the Mexican Plateau. It is bordered on the west by the extensive Sierra Madre Occidental range, along with northern portions of the Sierra Madre Oriental range. On the Mexican side, it covers the northern half of the state of Chihuahua, along with the majority of Coahuila, north-eastern Durango, the extreme northern part of Zacatecas, and small western portions of Nuevo León. With an area of about 362,000 km2 (139,769 sq mi), it is the third largest desert of the Western Hemisphere and the second largest in North America, after the Great Basin Desert. Several larger mountain ranges include the Sierra Madre, the Sierra del Carmen, the Organ Mountains, the Franklin Mountains, the Sacramento Mountains, the Sandia-Manzano Mountains, the Magdalena-San Mateo Mountains, the Chisos Mountains, the Guadalupe Mountains, and the Davis Mountains. These create "sky islands" of cooler, wetter, climates adjacent to, or within the desert, and such elevated areas have both coniferous and broadleaf woodlands, including forests along drainages and favored exposures. There are a few urban areas within the desert: the largest is Ciudad Juárez with almost two million inhabitants; Chihuahua and Torreón; then the US cities of El Paso and Albuquerque. Las Cruces and Roswell are among the other significant cities in this ecoregion. Saltillo, Monterrey, and Santa Fe are located near the Chihuahuan desert. According to the World Wide Fund for Nature the Chihuahuan Desert may be the most biologically diverse desert in the world as measured by species richness or endemism. The region has been badly degraded, mainly due to grazing. Many native grasses and other species have become dominated by woody native plants, including creosote bush and mesquite, due to overgrazing and other urbanization. The Mexican wolf, once abundant, has been extirpated. The desert is mainly a rain shadow desert because the two main mountain ranges covering the desert, the Sierra Madre Occidental to the west and the Sierra Madre Oriental to the east block most moisture from the Pacific Ocean and the Gulf of Mexico respectively. Climatically, the desert has a dry climate with only one rainy season in the summer and smaller amounts of precipitation in early winter. Most of the summer rains falls between late June and early October, during the North American Monsoon when moist air from the Gulf of Mexico penetrates into the region. Owing to its inland position and higher elevation than the Sonoran Desert to the west, mostly varying from 600 to 1,675 m (1,969 to 5,495 ft) in altitude, the desert has a slightly milder climate in the summer (though usually daytime June temperatures are in the range of 35 to 40 °C or 95 to 104 °F) and cool or cold winters with occasional frosts. The average annual temperature in the desert is 24 °C (75 °F), which varies with altitude. The hottest temperatures in the desert occur in lower elevation areas and in valleys. Northern areas have more severe winters than the southern portion and can receive snowstorms. 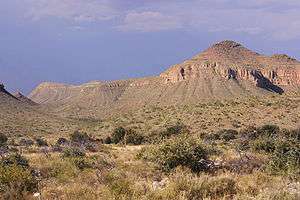 The mean annual precipitation for the Chihuahuan Desert is 235 mm (9.3 in) with a range of approximately 150–400 mm (6–16 in), although it receives more precipitation than other warm desert ecoregions. Nearly two-thirds of the arid zone stations have annual totals between 225 and 275 mm (8.9 and 10.8 in). Snowfall is scant except at the higher elevation edges. The desert is fairly young, existing for only 8000 years. 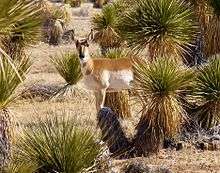 Pronghorn and lechuguilla are native species of the Chihuahuan Desert. Creosote bush (Larrea tridentata) is the dominant plant species on gravelly and occasional sandy soils in valley areas within the Chihuahuan Desert. The other species it is found with depends on factors such as the soil, altitude, and degree of slope. Viscid acacia (Acacia neovernicosa), and tarbush (Flourensia cernua) dominate northern portions, as does broom dalea (Psorothamnus scoparius) on sandy soils in western portions. Yucca and Opuntia species are abundant in foothill edges and the central third, while Arizona rainbow cactus (Echinocereus polyacanthus) and Mexican fire-barrel cactus (Ferocactus pilosus) inhabit portions near the US-Mexico border. Wikimedia Commons has media related to Chihuahuan Desert. ↑ Wright, John W., ed. (2006). The New York Times Almanac (2007 ed.). New York, New York: Penguin Books. p. 456. ISBN 0-14-303820-6. 1 2 "Chihuahuan desert". Terrestrial Ecoregions. World Wildlife Fund. Retrieved 2010-10-22. 1 2 3 4 5 "The Chihuahuan Desert". New Mexico State University. Retrieved February 16, 2013. 1 2 3 "Chihuahuan Desert". National Park Service. Retrieved February 16, 2013. 1 2 "Chihuahuan Desert". Encyclopedia of Earth. Retrieved February 16, 2013.